My food co-op now sells hunks of lamb sirloin in less than 1/2 pound servings. Ever since I discovered the delectable joys of overcooked lamb braised in white wine — that’s what it amounts to, frankly — I grab any chance I get to cook lamb in portions that are affordable and sensible for me. Let me be clear. I adore lamb grilled only so long enough that it takes the intensity off its rare fuschia coloring. The flavor of lamb is really at its best minimally cooked with a minimum of herbs. But the French know what they are doing when they braise a leg of lamb FOREVER in white wine, carrots and leeks. The combination of lamb and white wine is one of the most neglected forms of alchemy I can think of. Lamb braised until the connective tissues dissolve is heaven. But can one attain heaven on one’s own? That is my perennial dilemma. The availability of chunks of lamb leg means that I can accomplish on a small scale what I’ve only ever achieved with a whole leg. Preheat oven to 325. Pour a slug of oil into a heavy bottomed pan that is ovenproof and heat over mediu-high heat. Sprinkle 1-2 tsps of the spice mixture, ras el-hanout, and salt over the meat on both side. When the oil is hot, sear the meat in the oil, about 3 mins per side. Remove to a plate. Add the carrots and leeks to the oil in the pot. If needed, add more olive oil. Sauté the vegetables until soft, about 5 to 8 mins. Place the seared lamb on top of the carrots and leeks. Pour in about half a bottle of white wine. The liquid should come about a third to halfway up the side of the meat. When the wine comes to a boil, cover with aluminum foil and the place the pot in the preheated oven. Set the timer for 45 mins. Meanwhile, prepare the collard greens. Chop the de-stemmed greens. Put a pot of heavily salted water on to boil. Drop the chopped greens into boiling water and blanch for 5 mins. Drain, put the greens in a single serving dish and place it in the oven until the lamb is done. Check the liquid in the lamb pot after 45 mins. If the wine is mostly evaporated, add more. When an hour has nearly passed, check the lamb again. The meat should be at the point of falling apart. Remove the pot from the oven, place the meat on a cutting board. Slice or shred with fork. Taste the sauce with vegetables in the pot and adjust the seasoning. 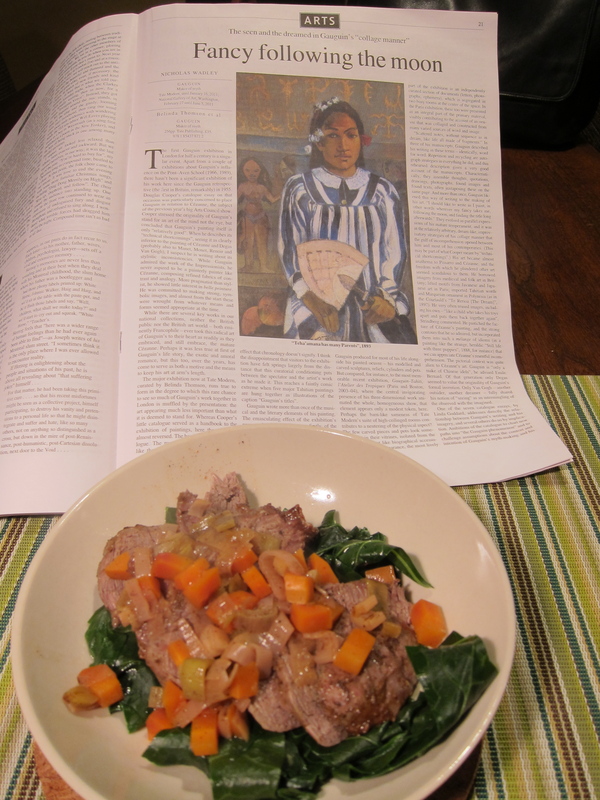 Place the lamb on the collard greens and pour the sauce with vegetables over the lamb. Don’t burn yourself as you carry the plate to the table and eat.